Alberto Moreno is delighted Coutinho stayed at Liverpool this transfer window just gone. As we all know, he was the subject of multiple bids from Barcelona and was desperate to join the Spanish giants – kicking up quite an internal fuss about our refusal to do business with the petty Catalans. 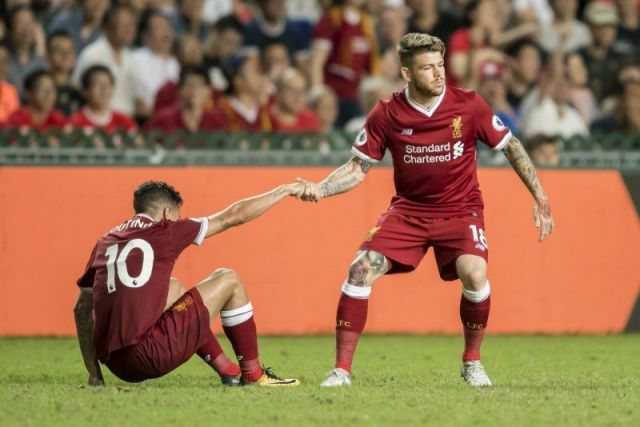 Moreno looked set to depart the club too, but enjoyed a strong pre-season and is now arguably the club’s starting left-back, ahead of James Milner and new signing Andrew Robertson. In fact, both Moreno and Coutinho could start in the Champions League tonight against Sevilla. “I missed him, he’s probably my best friend at the club. I was very happy to have him back,” Moreno told the Daily Mail. “It was tough for him,’ he said. ‘He had a bad time but it’s over now and I know that he will give everything for Liverpool. Part of the reason Coutinho has settled back into first-team training so seamlessly is because he’s got Moreno by his side. Along with Roberto Firmino, the trio form Liverpool’s latin contingent, which did stand at four before Lucas departed for Lazio in the summer. Hopefully, Coutinho can get up and running quickly. It won’t take long for fans to forgive his disrespect if he starts doing the business on the field. On the basis of Saturday’s capitulation to Manchester City, we need him.